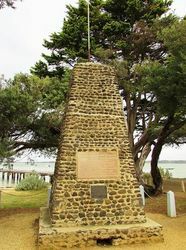 A monument commemorates George Bass, the visits of Lieutenant James Grant and Lieutenant John Murray, the French expeditions of Nicholas Baudin and Dumont Dúrville, and the settlement of Fort Dumaresq on this site. A plaque was added to the memorial in 2001 to commemorate the bicentenary of the landing of Lieutenant James Grant and the mapping of Western Port by Francis Barreillier. To commemorate the discovery of this port by Surgeon George Bass, 4th January, 1798, and the visits paid by Lieut. James Grant, March, 1801, Lieut. John Murray, December, 1801, French expedition under Capt. Baudin, April, 1802, and Capt.d'Urville, 1826. Lord Stradbroke eulogised the hardihood and courage of the early explorers and the wonderful progress and development of Phillip Island, which he regarded as having an exceptional future. In the evening the Governor entertained at dinner at the Isle of Wight Hotel, Cowes, 35 soldiers and soldiers' fathers. The function was a success. The presentation of 50 fine views, of Phillip Island and Westernport, in a specially inscribed album, was made to the Governor by Mr. E. V. McHenry. Age (Melbourne, Vic), 20 February 1923. They left Sydney at 6pm on Sunday December 3rd 1797. They reached this point Rhyll on Jan 18th 1798.
to South America in 1803. He disappeared and his fate remains a mystery.